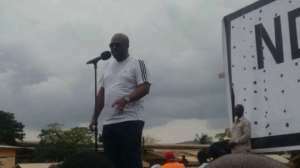 Former President, John Dramani Mahama has called for a stakeholders conference to address challenges associated with the implementation of the free Senior High School (SHS) policy. 'It will do the government good, if we have a stakeholders conference and agree on the pace of implementation to free funds for other important projects like the 'one district one factory and the one village one dam programmes,' he said. He called for the review of the strategy for implementation to give the opportunity to families that could afford to pay for their wards, while students from homes that could not afford to pay were given bursaries to ensure long term sustainability of the programme.